Students eagerly learn the value of U.S. money when these images are on display. To reinforce counting and math skills, create a classroom store for shopping and making change. 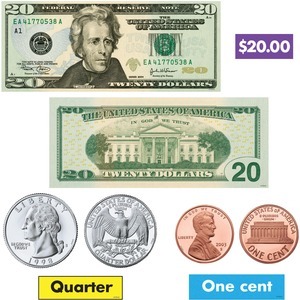 It includes fronts and backs of six coins (penny, nickel, dime, quarter, half dollar, dollar) and four bills ($1, $5, $10, $20), 31 labels featuring coin/dollar amounts and names, and coin values. Bills are oversized and compliant with U.S. regulations. Set also includes 17" equivalency chart. Included Discovery Guide is filled with creative activities that teach and delight.